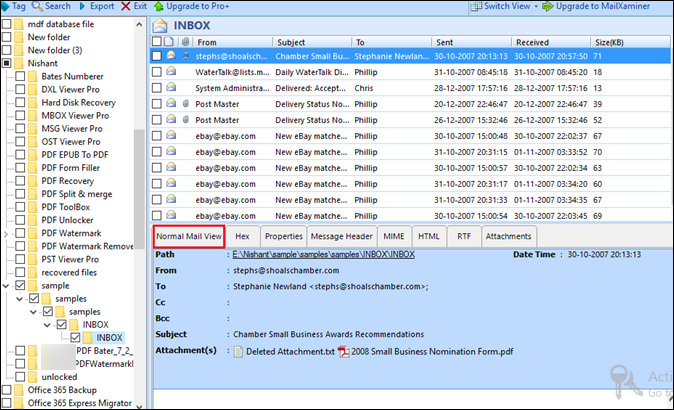 MSG Reader tool allows users to open and read all the emails in MSG file format. It is not necessary to install MS Outlook in the system. Users can effortlessly preview the content of emails with accurate formatting. In addition, it will provide with the complete properties of MSG file, which includes: From, sent date, received, subject, date and size (in KB). The software permits all users to view MSG data files in multiple options. Users can read and examine the MSG files in Normal view mode, message header view, RTF view, Hex view, property view, MIME view, and HTML view. Users can view the attachments as well with this software. 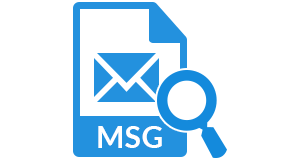 MSG Viewer tool is designed in Windows Explorer style interface. It allows users to locate folders consists of MSG files automatically. This tool helps users to read and view any of the file or folder from any location of the system. Once you run the software, it quickly scans the folder, which consists of MSG files. After the scanning, it provides an instant preview. With this software, it is very easy to view and search all the files in MSG format. It is designed with advance algorithms thus users can filter the emails as well as attachments if required by putting in the keywords. Moreover, several criteria can be added to find a relevant search. 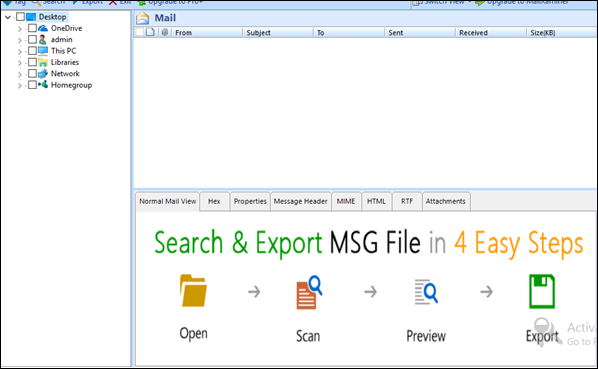 MSG Viewer Freeware utility is especially designed for Windows users. It is compatible with all the versions of Windows Operating system, which includes version 7, 8, 8.1, 10, Vista, XP, etc. Therefore, any Windows user can easily use the software once it is installed in the system to view MSG files. After users load the MSG file in the software, all the data files can be re-arranged in its order of listing through its attributes. The MSG files can be sorted by its properties such as From, Subject, To, etc. There is no requirement of Outlook to perform the entire function. Can I save the emails along with the attachments with MSG Viewer for Windows tool? No, you are not allowed to save the files by using this software. Is there any kind of limitation to view the MSG files? No, you can open, view and read as many files as you want with this software. Is it necessary to install Outlook or any other utility to access the tool? No, MSG Viewer is a stand along utility and does not depend on any other utility to perform the task. 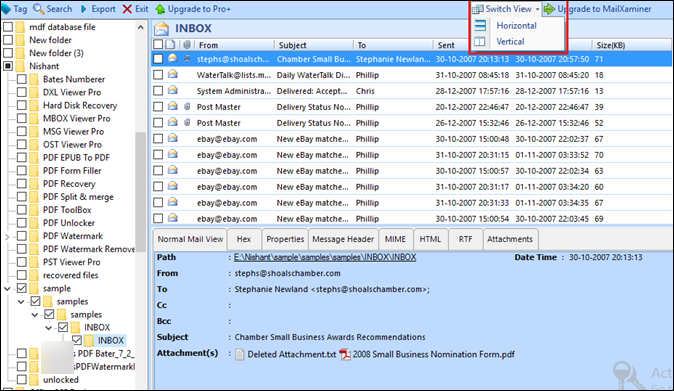 Therefore, you can view MSG files without Outlook. Is the software compatible with all the versions of Windows? Yes, in fact it is especially designed for Windows platform. Can I view the MSG file stored in pendrive? Yes, you can easily view MSG files stored in pendrive with MSG file viewer. Run the software, go to Start » All Programs » MSG File Viewer. A window of the software will appear. Choose the file or the folder; once it is done all the emails of, the selected MSG files can be viewed on the panel of the software. "Believe me, MSG Viewer freeware tool is a must use tool or applications. Easy to use, provides filter options to make the task quick, and allows to view MSG files online along with the attachments. All these facilities are free of cost. I mean this is amazing. I would like to recommend this tool whenever you need to read MSG files." "I, as a customer, am fully satisfied with this software. One of my clients has sent me MSG file and I did not have Outlook in my system. I was worried how to view MSG file, but as soon as I get to know about this software, I used it and read the MSG file. Thank for such a wonderful utility."